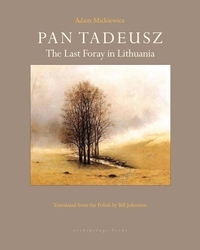 A towering achievement in European literature, Pan Tadeusz is the central work of the Polish literary canon, heralded for its lovingly detailed recreation of a bygone world. The traditions of the Polish gentry and the social and natural landscape of the Lithuanian countryside are captured in verse of astounding beauty, simplicity, and power. Bill Johnston's translation of this seminal text allows English-language readers to experience the richness, humor, and narrative energy of the original.